WASHINGTON, D.C. -- U.S. transportation workers led all major occupation types by a large margin in their 2016 diabetes rate, at 10.3%. This is double the rate seen among physicians (5.1%), the occupation with the lowest reported prevalence. Farmers/Fishers/Foresters reported the second-highest rate, at 8.5%. 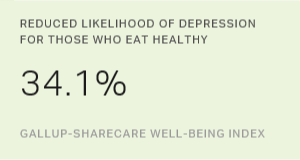 These results are based on more than 90,000 interviews with U.S. workers conducted throughout 2016 as a part of the Gallup-Sharecare Well-Being Index. The Well-Being Index does not differentiate between Type 1 and Type 2 diabetes, but instead asks: "Has a doctor or nurse ever told you that you have diabetes?" Diabetes remains an ongoing public health problem in the U.S. Researchers estimate that about one in three Americans born in the year 2000 will be diagnosed with diabetes in their lifetime, and the percentage of Americans with the disease will at least double from current levels by the year 2050. Diabetes prevalence by occupation highlights opportunities for employers to implement diabetes prevention and management programs tailored to their workforces. Overall, in 2016, 11.6% of U.S. adults reported having been diagnosed with diabetes. The average diabetes rate was lower among workers (6.8%), who tend to be younger and in better health than the general population (which includes retirees and the unemployed). Workers with health insurance are more likely to be diagnosed with diabetes than those without coverage, probably because those with coverage are more likely to routinely see a doctor. However, the large majority of workers have health insurance, and the rates of insurance coverage do not vary enough by occupational category to explain the differences in diabetes diagnoses. In addition to having the highest current diabetes rate, transportation workers are also at greatest risk of being diagnosed with the disease in the future. Workers in manufacturing/production, installation/repair and construction/mining round out the top four occupations most at risk of new diabetes diagnoses. This is based on an analysis of several key risk factors for developing diabetes. Chief among these is obesity, which quadruples the risk of diabetes across most age groups -- particularly those aged 25 to 64, who are generally in their prime working years. Other risk factors include smoking, heavy drinking, a poor diet and a sedentary lifestyle. Transportation workers have by far the highest obesity level at 40.3%, followed by manufacturing/production workers at 31.2%. Construction/Mining workers have the highest smoking rate at 30.2% and the highest percentage of heavy drinking (15+ alcoholic drinks per week) at 10.1%, while installation/repair workers have the second-highest smoking rate at 27.2%. Transportation workers trail only clerical/office workers for the lowest percentage of getting at least three days of 30+ minutes of exercise per week. Other factors, such as age, race/ethnicity and genetic predisposition can all increase the chances of any given individual developing diabetes. This may explain why some occupation types such as construction/mining have workers with a high risk of developing the disease, but low diabetes rates currently -- and vice versa in the case of farmers/fishers/foresters. It is also important to note that the diagnosis of diabetes for some respondents may have occurred many years before they were interviewed, and accordingly, their health status and behaviors today are not necessarily the same as they were at the time of their diagnosis. Regardless, making behavioral changes that are within one's control is critical for preventing new onset of diabetes and managing the disease once it is diagnosed. U.S. workplaces are not immune from the slow but steady rise in the diabetes rate over the last decade. The prevalence of diabetes for some job types -- in particular transportation and farming/fishing/forestry -- is alarmingly high and can be costly. The estimated annual cost of diabetes to the U.S. economy because of financial burden, healthcare utilization and lost productivity in the workplace is $245 billion per year, according to a 2013 American Diabetes Association report. This cost is likely disproportionately higher for the transportation industry, given its workers' exceptionally high diabetes rate and elevated risk of future diabetes diagnoses. Employers in the manufacturing/production, installation/repair and construction/mining industries also face daunting challenges with high percentages of workers who -- regardless of factors that are outside of their control such as age or genetics -- are substantially increasing their chances of getting diabetes. And while workers in some industries such as construction/mining are younger than average and consequently less likely than most counterparts to already have diabetes, their choices and current overall health substantially elevate their odds of eventually being diagnosed. Practical solutions can help curtail this trend. Population health programs such as the Blue Zones Project in the Beach Cities, California, have a proven track record of reducing above-normal weight and smoking while boosting exercise and healthy eating, resulting in reduced diabetes prevalence among residents. Employers, too, can play a decisive role in the lives of their workers -- including remote workers -- by establishing incentives, recognition systems and a workplace culture designed to promote active living and healthy choices. "There is a pressing need for diabetes education outside the traditional walls of the hospital," says Shelia Holcomb, vice president of Sharecare Diabetes Solutions. "Weight management, nutrition and physical activity programs in the workplace are important topics to help prevent and manage Type 2 diabetes. Employers, especially those who have high-risk populations, should collaborate with their local hospital or health system to bring pre-diabetes and diabetes education to their workforces, thus improving the health and performance of their employees and reducing their future healthcare costs." More broadly, Gallup research has found that workers with high well-being are significantly less likely than those with poor well-being to gain new onset diabetes 18 months later. Furthermore, this relationship was found across five key areas of well-being (purpose, social, financial, community and physical). This underscores the need for employers to help their workers thrive in all aspects of well-being, rather than physical wellness alone, to combat the rise of diabetes and its associated costs in their workplaces. 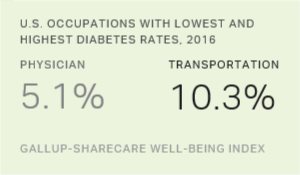 Read more about the state of diabetes in the U.S. in Gallup and Sharecare's Face of Diabetes report. 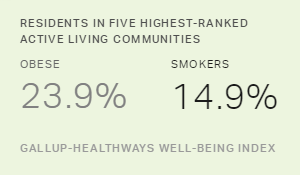 Results are based on telephone interviews conducted Jan. 2-Dec. 30, 2016, as part of the Gallup-Sharecare Well-Being Index survey, with a random sample of 91,424 workers aged 18 and older, living in all 50 U.S. states and the District of Columbia. For each reported group, the margin of sampling error ranges from a high of ±3.0 percentage points for those in the sales industry to a low of ±0.5 points for transportation workers at the 95% confidence level. All reported margins of sampling error include computed design effects for weighting. For the risk factor analysis, Gallup and Sharecare applied a unique weight derived from a regression model to account for each of the risk factors' differing influence on diabetes occurrences and then computed an overall future risk level for each occupation type (regardless of current diabetes prevalence). 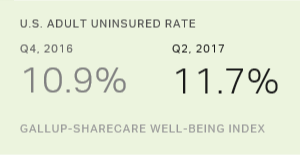 The percentage of uninsured adults in the U.S. rose to 11.7% in the second quarter of 2017, from 10.9% in each of the last two quarters of 2016.